View of Sidney Sussex College at Cambridge from the gardens. The college is one of two colleges established in Elizabethan times. It was founded in 1594 by Lady Francis Sidney, Dowager Countess of Sussex. Formerly the site of a Franciscan Friary in Cambridge. 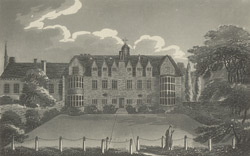 This print shows the back of the Hall, which is part of the Hall Court designed by Ralph Symons in c.1600. It is built of brick and has a heavily gabled roof. The high table end of the hall has a large semi-circular bay window which is matched by another at the kitchen/lodge end. This type of window was fashionable c.1600.